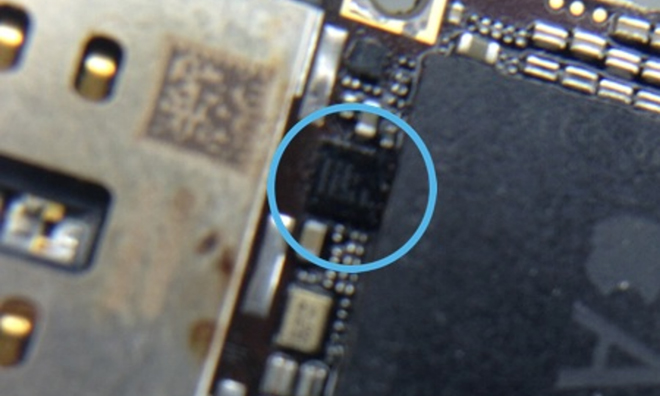 An iOS device repair company in the UK reports third-party charging accessories are causing damage to a critical power management component in Apple’s iPhone 5, rendering the handset inoperable. After seeing a rash of iPhone 5 handsets come in with battery charging issues, repair firm mendmyi was able to isolate the problem to unofficial USB adapters and USB-to-Lightning cables, the company reported on its blog earlier this week. The theory is third-party charging accessories do not properly regulate electrical current flowing into the handset, which either burns out or renders inoperable a power distribution IC labeled “U2.” Located just beneath Apple’s A6 SoC on the iPhone’s logic board, the IC routes power to the battery and integrated charging controller, the sleep/wake button and controls certain USB functions. Users affected by the issue may see iPhone battery levels remain at one percent while charging, unexpected shutdowns and partial or complete failure to power up when connected to a power source. It is unclear if the problem is limited to the iPhone 5, but in theory cheap third-party products like USB adapters could potentially damage the sensitive circuitry of any iPhone model as they may not be built to acceptable tolerances and are thus unable to properly regulate voltage and current. As evidenced by Apple’s recent recall of European market 5-watt power adapters, even the world’s largest tech company runs into problems with manufacturing power regulating accessories. Apple previously issued a warning to Chinese iPhone users last July asking that they use only official power adapters like those supplied with the device. The notice was issued after two people were electrocuted, one fatally, by iPhones connected to “counterfeit” adapters. According to mendmyi, damaged U2 ICs can be replaced and the company charges 66 pounds, or roughly $112, for the service.